Vascular Institute of Michigan is proud to offer diagnostic testing here at our facility. Patients no longer have to be inconvenienced with multiple appointments at various facilities. VIM provides a one stop shop experience to our patients for all their vascular needs. Here at VIM we are empathetic with our patients and schedule your visit with the physician immediately following your testing. This way patients can be saved from paying multiple copays and visits and receive immediate results. Before a Vascular Surgeon can take their board certification in Vascular Surgery, The American Board of Surgery is now requiring the Physician to obtain a new credential called RPVI (Registered Physician in Vascular Interpretation). The American Board believes, as do we, that only a qualified physician should be interpreting a non-invasive vascular study. At VIM all of our physicians carry the RPVI credentials. Vascular Institute of Michigan takes quality control and quality measures very seriously. One avenue of maintaining our high quality of standards is to seek accreditation. We are actively moving through the process to obtain accreditation by the Intersocietal Accreditation Commission (IAC). 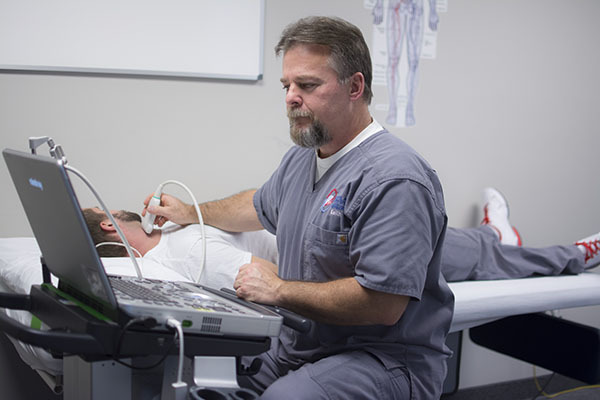 is a special ultrasound technique that evaluates blood flow through a blood vessel, including the body’s major arteries and veins in the abdomen, arms, legs and neck. 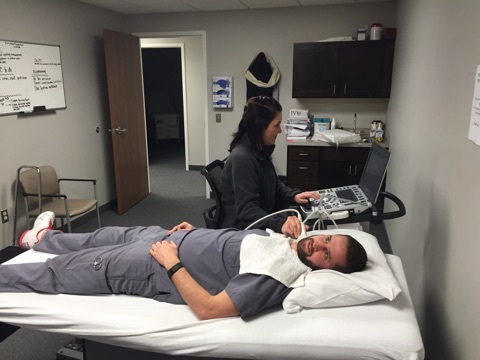 A Doppler Ultrasound study may be part of a venous ultrasound examination. is a noninvasive medical test that helps physicians diagnose and treat medical conditions. 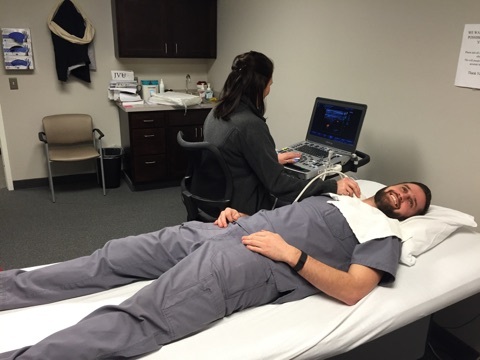 Ultrasound imaging, also called ultrasound scanning or sonography, involves the use of a small transducer (probe) and ultrasound gel to expose the body to high-frequency sound waves. Ultrasound is safe and painless, and produces pictures of the inside of the body using sound waves. Ultrasound examinations do not use ionizing radiation (as used in x-rays). Because ultrasound images are captured in real-time, they can show the structure and movement of the body’s internal organs, as well as blood flowing through blood vessels. 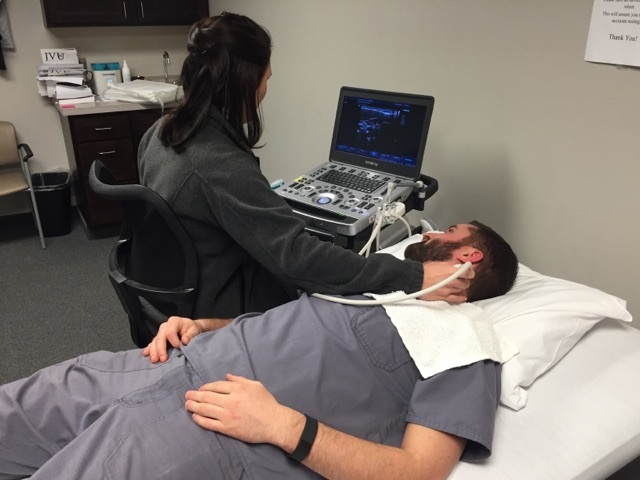 is a specialized sonographer who goes through an accredited training program in interpreting Vascular Studies. Vascular Technicians differ from General Technicians that are used by most non specialized, stand-alone, testing facilities. Vascular Technicians are highly trained in accurately evaluating the complete arterial and venous systems. provides pictures of the veins throughout the body. An Abdominal Aorta Duplex uses ultrasound to evaluate the blood flow through the aorta. The aorta is the large artery that takes blood from the heart to the entire body. This non-invasive test does not use needles, drugs or dyes. Gel is placed on the skin over the area to be studied. A hand held transducer, is used to make the pictures. The pictures will show the walls of the aorta and the blood flow through the aorta. Measurements will be taken to evaluate the size of the aorta. The doctor may order additional testing if this study is abnormal. Evaluate the blood flow through the Aorta. Allow 1 hour for the test. Take all of your regular medications with only a small sip of water, unless otherwise instructed by your physician. An arterial Doppler is an exam of the arteries located in your arms or legs. It is a test that uses Doppler ultrasound to measure the blood pressures in the legs to make sure there is normal blood flow. 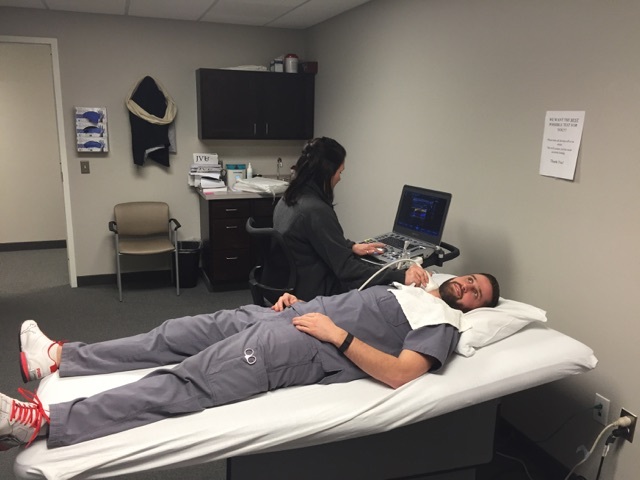 The test is usually done when there intermittent claudication (leg pain on exercise) Doppler ultrasound can help vascular surgeon evaluate arterial blockages, such as plaque in arteries. Severe or steady aching or burning sensation in the toes, heel or foot can be very painful. Temporary relief is found by keeping the leg and foot down in a lowered position for a short period of time (the effect of gravity helps blood flow). As the disease gets worse, wounds and injuries might not heal and the skin becomes easily injured and starts to break down, leading to gangrene. The function of blood circulation is transportation – bringing food and oxygen to the body’s cells and organs. As the heart pumps the blood, the arteries serve as highways to carry the blood away from the heart. The arteries must be open in order to keep the body’s cells alive and healthy. “Peripheral” means the arteries that run along the arms and legs. The inside wall of a healthy artery is smooth and firm, where blood flows freely. As we age, the arteries may be affected by atherosclerosis – or “hardening of the arteries.” The inner lining of the artery gets thick and rough, with a buildup of cholesterol or fat, like rust in a pipe. This buildup is called “plaque,” and it can cause the artery to become narrow or even close off completely which could reduce or stop blood flow. Atherosclerosis can occur in all arteries, but the ones in the heart, neck, and legs are the most commonly affected. The exam is not painful; there are no needles, catheters or dyes used. There are no X-rays. The test has no side effects. 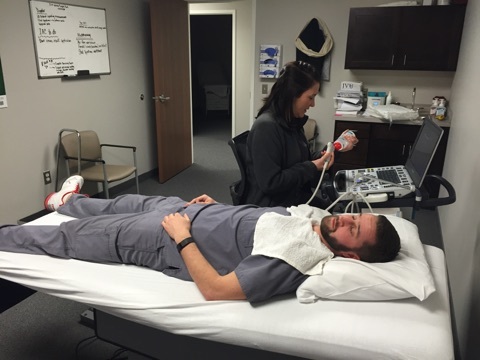 The exam uses ultrasound to listen to your blood flow. You will be lying on a bed, and you will be asked to remove your clothing from the waist down for a better examination of your legs. The technician will ask you several questions about the reasons your physician ordered the exam. Recordings of the arterial flow in the upper or lower extremities will be taken by placing a small, smooth probe over parts of your arms and legs. This will determine whether a serious blockage is present in the large arteries. The circulation to your feet and toes also will be examined. Your physician will receive a written interpretation of the test results within two to three days, and the physician will tell you what you should do next. The ultrasound tech will notify your physician immediately with the results if they notice a potentially serious problem. If your doctor suspects you might have peripheral arterial occlusive disease, blockage of the arteries, he or she may order an arterial Doppler exam to confirm the diagnosis. 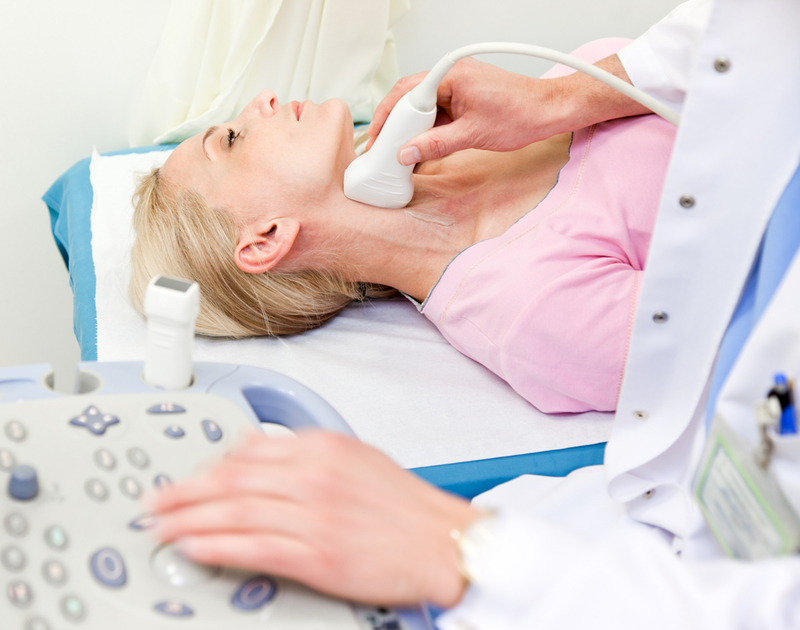 There is no radiation used and generally no discomfort from the application of the ultrasound transducer to the skin. Blood pressure cuffs are used and may cause mild discomfort when inflated. Be sure to discuss any concerns with your doctor prior to the procedure. Wear comfortable clothing that is easily removed before testing. Testing is approximately 45-60 minutes. The exam uses ultrasound to look at the inside of your arteries and evaluate blood flow. Images of the arteries and blood flow in the upper or lower extremities will be taken by placing gel and an ultrasound probe over parts of your arms and legs. This will determine whether a serious blockage is present in the large arteries. Wear comfortable, easily removable clothing. Testing is approximately 60-90 minutes. Your carotid arteries are the two large blood vessels in your neck that supply blood to your brain. When these arteries become clogged with cholesterol, they become dangerously narrow. If a blood clot occurs in the carotid arteries, then blood cannot reach your brain and a stroke can result. A carotid artery duplex scan is a noninvasive (the skin is not pierced) procedure. The term "duplex" refers to the fact that 2 modes of ultrasound are used; Doppler and B-mode. The B-mode transducer (like a microphone) obtains an image of the carotid artery being studied. The Doppler probe within the transducer evaluates the velocity and direction of blood flow in the vessel. A probe (also called a transducer) sends out ultrasonic sound waves at a frequency too high to be heard. 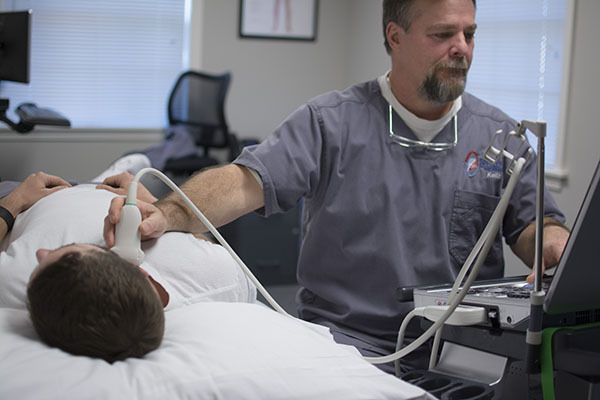 When the probe is placed on the carotid arteries at certain locations and angles, the ultrasonic sound waves move through the skin and other body tissues to the blood vessels, where the waves echo off of the blood cells. The transducer picks up the reflected waves and sends them to an amplifier, which makes the ultrasonic sound waves audible. Absence or faintness of these sounds may indicate an obstruction to the blood flow. A related procedure that may be performed to further evaluate the carotid artery and its branches is either a magnetic resonance arteriogram (MRA) or a carotid arteriogram, which is more invasive. 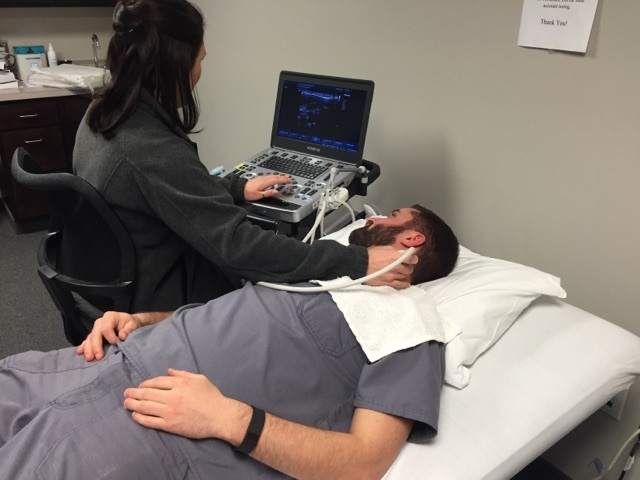 A carotid artery duplex scan is used to assess occlusion (blockage) or stenosis (narrowing) of the carotid arteries of the neck and/or the branches of the carotid artery. Plaque (a buildup of fatty materials), thrombus (blood clot), and other substances in the blood stream may cause a disturbance in the blood flow through the carotid arteries. When the carotid arteries become blocked, symptoms may include dizziness, confusion, drowsiness, headache, momentary blindness in one eye, and/or a brief loss of ability to speak or move. These symptoms may indicate early warning signs of a possible stroke (brain attack, or cerebrovascular accident [CVA]). A carotid artery duplex scan may also be performed when no symptoms of occlusion are present, yet an abnormal blood flow sound called a bruit (pronounced "BROO-ee") is heard with a stethoscope over the artery. This may indicate a possible condition of abnormal blood flow in the artery. Your doctor may give you specific instructions about smoking and consuming caffeine. You may be asked to refrain from smoking for at least 2 hours before the test, as smoking causes blood vessels to constrict. You may also be asked to refrain from consuming caffeine in any form for about 2 hours prior to the test. You will lie on an examination table with your neck slightly extended (bent backward). A clear gel will be placed on the skin at various locations on the carotid arteries. The Doppler transducer will be pressed against the skin and moved around over the area of the artery being studied. When blood flow is detected, you will hear a "whoosh, whoosh" sound. The probe will be moved around to compare blood flow in different areas of the artery. Both sides of the neck will be examined. Once the procedure has been completed, the gel will be wiped off. Testing done pre-operatively to determine suitability of the veins and arteries for dialysis access (AVF or AVG) placement in the upper or lower extremities. Assessment of size, location, and major branches of the Greater Saphenous, Short Saphenous, Cephalic, and Basilic veins using gel and an ultrasound to obtain images. In the setting of AV fistula planning, a tourniquet should applied to the patient’s arm and the vein remeasured. The larger of the diameters (with or without the tourniquet applied) will then be recorded on the worksheet. The outer to outer diameter of the distal Brachial artery (just above the elbow) and Radial artery (at wrist) is also measured in the setting of fistula planning. Determine diameter, length and suitability of the superficial veins for placement of dialysis access fistula or graft. The test takes 30 to 60 minutes to complete. Consider wearing an undershirt, such as a tank top, as the full arm will need to be exposed. Please plan to arrive about 15 minutes before your scheduled appointment to complete the registration process. Blood pressure cuffs are applied on both upper arms, forearms, and fingers. The ultrasound technician will use a Doppler machine to record waveforms of artery and finger. Cuffs are then inflated to obtain pressures within the Manual compression maneuvers are then done by the technician on the wrist. This instructs the physician whether the patient is dependent on one or both arteries that supply blood flow to the hand. Evaluation of arteries for blood flow, blockage, and dependency. The test takes 45 to 60 minutes to complete. Consider wearing an undershirt, such as a tank top, as the full arm will need to be exposed. Please plan to arrive about 15 minutes before your scheduled appointment to complete the registration process. Ultrasound examination that is performed post-operatively on the arteriovenous fistula or graft to determine usability or for any blockages and narrowing that may occur. Once a dialysis access is placed your physician may order this test to check the status of your access and if functioning appropriately. Arteriovenous access will typically have a thrill or vibration due to turbulent flow within the graft or vein. Changes in the thrill may indicate a problem with the graft. A weak thrill can denote poor arterial inflow or arterial stenosis. Feeling a pulse rather than a thrill may signify high-grade stenosis at the outflow of an AVF or at the venous anastomosis of an AVG. Furthermore, significant increase in venous pressure during dialysis can indicate a stenosis at the venous anastomosis or outflow vein. 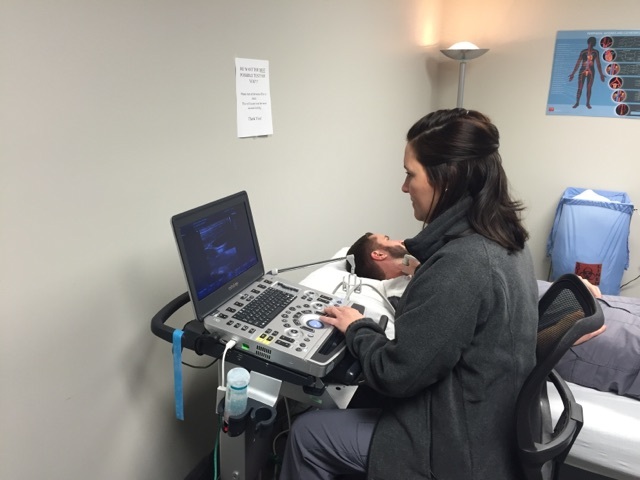 Once the AVF or AVG has been placed is it important to attend your regularly scheduled ultrasound appointments to evaluate for maturation, patency, and to rule out any narrowing or blockage. 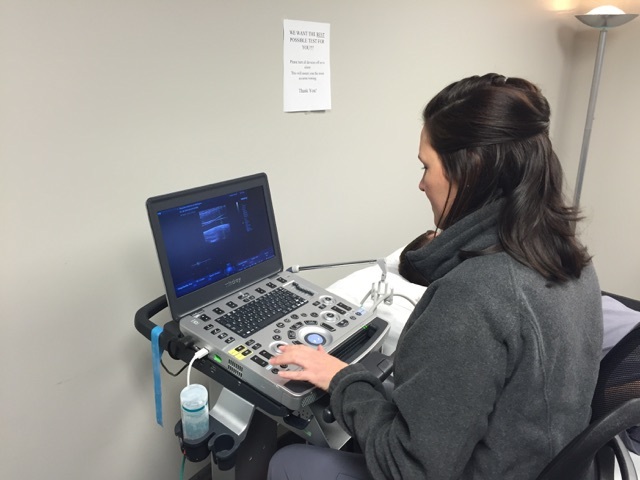 The exam uses ultrasound to look at the inside of your dialysis access and evaluate blood flow. You will be lying on a bed, and you may be asked to remove your clothing from the site of the access. The technician will ask you several questions about the reasons your physician ordered the exam or any problems you may be experiencing. Images of the fistula or graft, and blood flow, will be taken by placing gel and an ultrasound probe over the entire access site. This will determine whether the access has matured and is ready for use, or a serious blockage is present. Determine size and velocity of hemodialysis access or any narrowing that may be present. These tests examine the intestinal and kidney arteries. Plaque in these arteries can occasionally cause abdominal pain and in the case of kidney artery blockage, can lead to severe high blood pressure. A Renal Artery Duplex is an ultrasound test that uses high frequency sound waves (ultrasound) to examine the renal arteries. The renal arteries deliver blood to the kidneys. 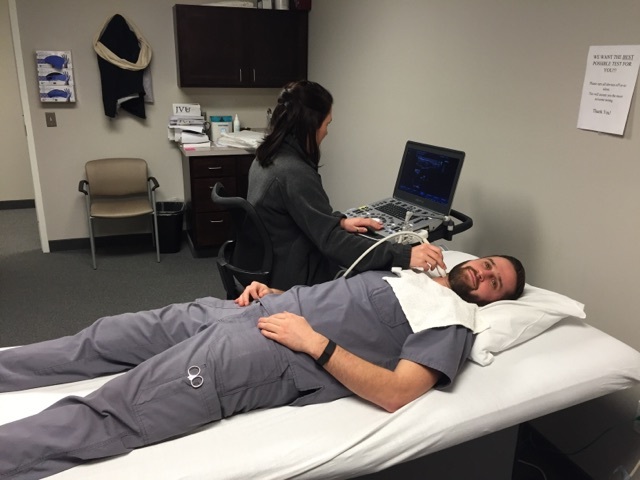 Ultrasound evaluation of the arteries that supply blood flow to the organs that are involved in food digestion. If there is not enough blood flow to help digest your food, you may feel abdominal pain or cramping after eating a meal. This test is done while you are lying on your back. Ultrasound gel is placed over your abdominal area that allows the ultrasound signals to travel to the mesenteric arteries. The technologist will use a transducer over the gel to visualize the mesenteric arteries. The technologist will use a transducer over the gel to visualize the mesenteric arteries. The ultrasound waves will bounce off of the blood vessels and travel back to the transducer, which produces the image on the ultrasound machine. Visualize any area of narrowing in the artery and take measurements of the blood flow. You will hear a “swooshing” sound when the Doppler is turned on which represents your blood flow. Wear loose, comfortable, easily removable clothing to your testing appointment. Testing is approximately 45-60 minutes. Avoid eating, drinking, chewing gum, and smoking for 6-8 hours prior to the test or overnight prior to the day of the test. It is very important to follow the preparation instructions to receive accurate testing results. A Pulse Volume Recording (PVR) study is a noninvasive vascular test in which blood pressure cuffs and a hand-held ultrasound device (called a Doppler or transducer) are used to obtain information about arterial blood flow in the arms and legs. Noninvasive means the procedure does not require the use of needles, dyes, radiation or anesthesia. The blood pressure cuffs and Doppler are used to determine the presence, severity and general location of peripheral arterial occlusive disease. A PVR may also be called a vascular study or Doppler segmental pressure study. The ABI is a measurement of the blood pressure in the lower leg compared to the blood pressure in the arm. Your physician will compare the two numbers to determine your ABI. Normally, the blood pressures in your ankle and arm should be about equal. But if your ankle pressure is half your arm pressure (or lower), it could be a sign that your leg arteries are narrowed. The blood pressure cuffs are placed on the arm and leg and inflated, while the Doppler is used to listen to the blood flow in the leg and arm. Evaluate the blood flow in your legs. 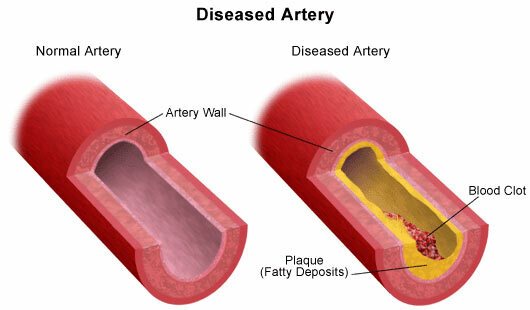 Exam helps your physician diagnose arterial disease in the legs, but it does not identify which arteries are blocked. The test takes 30 to 90 minutes to complete. Please plan to arrive about 15 minutes before your scheduled appointment to complete the registration process. During thoracic outlet testing, blood pressure cuffs are placed on the patient’s upper arms. The test is performed while the patient is sitting in a chair. The technologist will move the patient’s arms in different positions and take a blood pressure measurement at each position. Evaluate the blood flow in your arms. Exam helps your physician diagnose arterial disease in the arms, but it does not identify which arteries are blocked.